Yesterday the White House announced a Climate Data Initiative that encourages innovation from the private sector and the general public. It’s a call to use open government data on climate change risks and impacts in compelling and useful ways that help citizens, businesses, and communities make smart choices in the face of climate change. At Esri, we agree that America stands at a critical juncture. We must tap into our innovation to cut the carbon pollution that causes climate change and affects public health. This includes efforts big and small. We need to increase clean, alternative fuels in our energy portfolio; develop more efficient vehicles; and design smarter cities that foster informed citizens willing to do their part. We need to encourage walkable communities with smart transit and easy recycling programs. Cities must look at all options available to them: updating building codes, adjusting the way they manage natural resources, investing in more resilient infrastructure, and planning for rapid recovery from damages when severe weather events occur. We must increase climate resilience to strengthen roads, bridges, and shorelines to better protect people’s homes, businesses, and way of life. 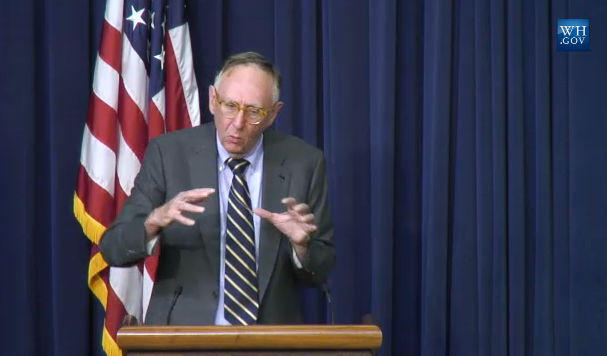 Jack Dangermond speaking at the Climate Data Initiative press conference at the White House, March 19, 2014. Esri is responding to the president’s important call to action in two ways. First, we are partnering with 12 large and small communities like New Orleans, Louisiana; Wake County, North Carolina; and Tamarac, Florida, to develop practical ways to address their most pressing needs using GIS technology. We’ll work with them to create maps and apps that we can share openly for the benefit of communities around the world so they can become more resilient to the challenges of climate change. Esri is also launching a climate-focused geo-collaboration portal where people can go to discover, contribute, and share resources that are critical to confronting the impacts of climate change. Along with those efforts, we recently announced the Esri Climate Resilience App Challenge. Developers from all disciplines can use open data and Esri apps, maps, services, and APIs to focus their talent on creating maps and analytical tools that will help communities establish and grow more resilient practices. As we partner with communities and our talented users to create solutions, I anxiously await the innovative ideas that will begin to appear. Our user community continues to impress me with enthusiasm, dedication, and innovative solutions for protecting the places and people that sustain us. Explore all the ways you can participate in making our world more resilient.